Blood Vessels are defined as a closed system of tubes that carries blood away from the heart and circulate the blood to the tissues of the body and then returns to the heart again. 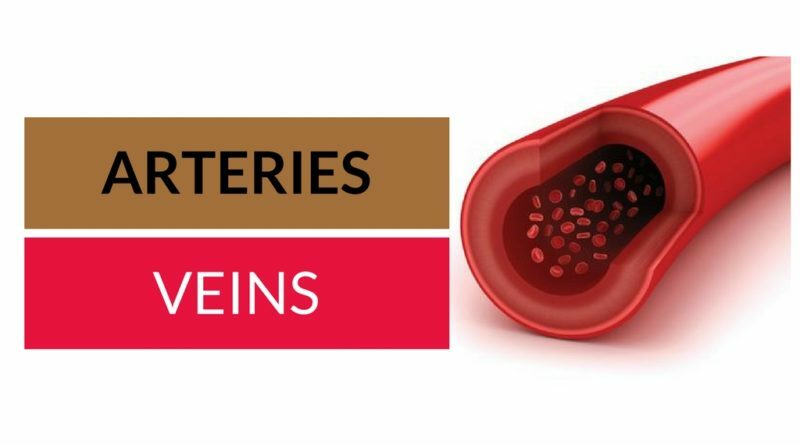 The blood vessels are classified into two types based on their thickness of blood vessels. They are arteries and veins. this article explains the differences between arteries and veins in a detailed manner. Arteries are the blood vessels which are thick walled and supply the blood from the heart to the different parts of the body. All the arteries carry oxygenated blood except pulmonary artery. The arteries are under high blood pressure situations, because they act as a pump to supply blood. Veins are the blood vessels which are thin walled and supply the blood from the parts of the body to the heart. All the veins carry deoxygenated blood except pulmonary vein. The veins are low blood pressure situations because they transport the blood with the help of muscle contraction and automatic closure of valves. Arteries transport blood from the heart to the different parts of the body. Veins transport blood from the body parts to the heart. Arteries are the blood vessels which move away from the heart. Veins are the blood vessels which move towards the heart. The blood pressure is high in the arteries because they act a pump to supply blood. The blood pressure is low in the veins because they supply blood through muscle contractions and automatic closure of valves. The arteries carry the oxygenated blood except pulmonary artery which carries deoxygenated blood. The veins carry the deoxygenated blood except the pulmonary vein which carries the oxygenated blood. The arteries do not have any valves because they carry blood from the heart to body. The veins have valves in them to control the blood flow and to prevent the back flow of the blood. The arteries can retain the shape when there is no blood or when cut across. The veins cannot retain the shape or collapse in blood is absent. Arteries are further divided into arterioles. Veins are further divided into venules. Arteries are deap-seated in The body and cannot be visible through the skin. Veins can be seen sub-cutaneously through the skin because they are present under the skin. Before concluding this article, we have to know about capillaries. The capillaries are microscopic vessels that usually connect arterioles and venules. The capillaries permit the exchange of substances between the blood and tissues. The arteries end in the capillaries and the veins start in the blood capillaries.